I'm with Mr. Green. I don't have a favorite book. I have favorites. Plural. That's probably the case for most readers. Could you pick a single favorite book from the past year? I was going to try to do that. Ha ha! Oh Jen, you silly thing. There's NO way I could pick just one! Wasn't this an amazing year for fiction? I can't wait to see what 2014 has in store. What were some of your favorites this year? Let me know in the comments! Almost all of these are on my TBR list. I better get hopping! I have not read a single one of these books! I always feel so behind when I read the best of posts. I always end up adding so many books to my TBR piles!! I haven't finished compiling my best of list yet, but I really enjoyed Howl's Moving Castle and Doctor Sleep. I know there are more, and I also like to wait until the year is over with. Last year, one of my favorite reads was read the last week of December! I'm glad you enjoyed so many books, good luck with 2014's readings!! I'm so glad to see Wolitzer on your list since I've just recently fallen in love with her work. And We Need New Names is at the tippy top of my to-read list in 2014. Burial Rites is popping up everywhere. I kind of wrote it off as a book i didn't want to read, but that is going to have to change! Also Ordinary Grace looks really good too and I'd never heard of it. Thanks. Wow, great list!! I'm 3/4 done with The Signature of All things and really enjoying it. Just downloaded The Interestings on audio, and am on the library list for Lookaway, Lookaway and Buriel Rites… looks like there'll be some excellent reading ahead. We Need New Names was AMAZING! I am planning on reading Burial Rites when I fly to Tampa for Christmas with my husband's family. Yay for Black Friday Kindle deals! It really would be rude to ask a bookish person to pick just one favourite. Impossible. This year really was brilliant for fiction! Now I feel bad. I haven't read any of these books yet. A few are on my wishlist and others sound like something I will enjoy! Yay, we share several favorites! I'm SO excited to finally get to The Signature of All Things over the next month for my book club. 3 of yours are also on my favorite list: Gilbert, Krueger and Morse. I have 3 more of those waiting for me to read. I love your taste! I just read Ordinary Grace and much enjoyed it. Another new book I just read was The Man He Became, about FDR and how polio impacted his life and brought out traits that made him the president he was. It is by James Tobin. I am ashamed to admit I have read none of these.....but I really do want to read We Need New Names, and soon. I've never understood how people could pick just one favourite book.... And with your book count I would have been very, VERY, surprised if you had managed it! Thanks for sharing your favourites. Burial Rites was almost among my top ten. And some of these I put on my TBR because of your reviews! I keep seeing The Signature of All Things popping up everywhere, from your lovely blog to The New Yorker. I was so put off by Eat Pray and Love that I haven't picked up this second book of hers. Maybe I'll have to now. Thanks for sharing your list! I could never narrow my list down to just one either :) These all sounds like great books! I haven't read any of these... Eeek, better get going! Got a few of these on my TBR pile!! Glad to see them in your list. I got Burial Rites during those insane Kindle deals after Thanksgiving and I can't wait to get to it. SOUNDS SO GOOD. I haven't read too many of your picks, but I did read ORDINARY GRACE and BURIAL RITES, and LOVED them both. ENJOY your reading and your Christmas week. THANKS for sharing all these titles. I am leaving a link back to my blog if you want to stop. Burial Rites is in my top reads of the year too, wonderful writing! There's a few here that I need to investigate further too. Happy Christmas! Great list! I love love loved Burial Rites and A Constellation of Vital Phenomena! There is no way I could pick just one. And if I tried, it would probably be a more recent one because it’s fresh in my mind and then I’d be doing a disservice to the older ones. Therefore, asking someone what their favorite book is is an insult and does a disservices to readers everywhere. Love reading everyone's "favorites" lists. I'd completely forgotten I have White Dog on my shelves! I haven't read any of these but I have heard of some of them. It really is hard to pick just one favorite book! Ack! I bought several of these through the year and dragged my feet on them. Definitely on my priority list for 2014! The Interestings was my #1 favorite this year. Several of your other choices were on my TBR radar, but I never got to them. Maybe in 2014! Great lists for both Fiction and non fiction Jennifer. I really want to get to the Signature of All Things this year. 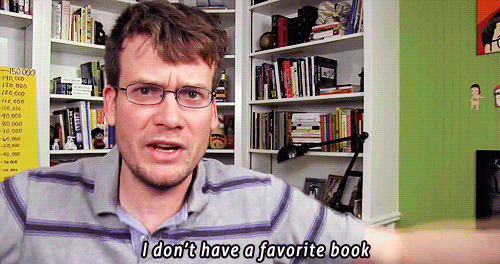 Every time someone asks my favourite book, I just kind of stare at them helplessly. "Quick, which one's your favourite child?" except you have 600 children.